A nanny to watch over your children regularly after school, or during a whole day? Or someone to accompany your family on holidays? Bsit, the collaborative childcare app is here to help for all those situations! 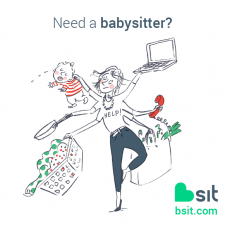 Download Bsit (Apple store – Play store), specify your babysitting needs (date, address, price, number of children...) and discover Sitters near you, recommended by the community... and known by your friends. Our goal: make parents' lives easier.